Web 2.0, social media, Facebook and Twitter, the internet itself had all been leading up to this: the IDF livetweeting its latest offensive on Gaza. There is now officially no aspect of human experience that cannot be represented via a series of brief, instant updates. War is social. Death is social. Terror is social. This isn’t a struggle over information. Propaganda isn’t an adequate descriptor. 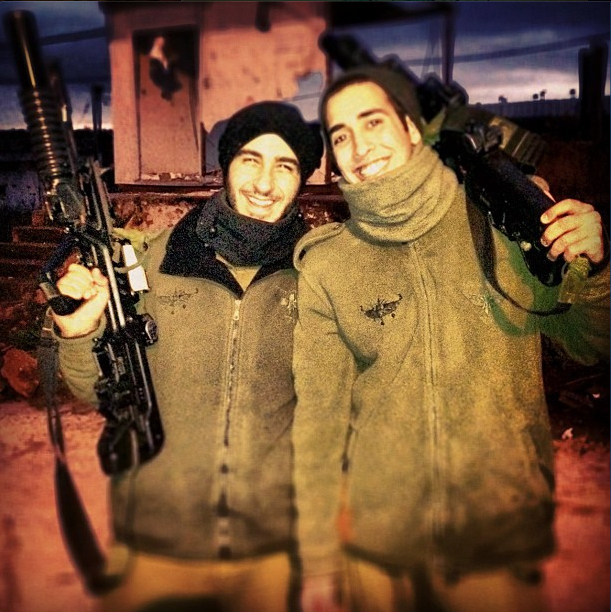 What the IDF is displaying is not superior PR, but greater nerve in asserting what is real. ‘This is the truth; retweet the truth,’ is the often overt meaning of those brief, terse, deeply absurd yet utterly banal communiqués. But the message is nothing without the participation. It’s the follows that give voice to @IDFSpokesperson. It’s the retweets that make its truth the Truth. The message is the medium. Months and years of live reportage from academic conferences, sporting events, the final of X-Factor or what you had for breakfast is what prepared the ground for this, what produced the rhetorical conventions, gathered the global audience and made it thinkable for a war operation not just to be narrated but to be waged in this way. We are coming for you, you’d better hide. But where? The internet is war. Every one of those tweets is a trigger being pulled, not figuratively but literally. It is both what announces death and what creates the discursive conditions for death. Social media has been weaponised. Tonight, more than 1 million Israelis are going to sleep in bomb shelters. This operation will bring a better tomorrow. Good morning to our friends in #America. While you were sleeping, 3 Israelis were killed when a rocket hit their house. The internet is war, and war is all there is. There is no diplomacy, no dissenting opinion, no alternative. Action is caused by its reaction. (They are firing back at us, so we are firing at them.) And the army is both the political arm and the arm that strikes, like in an insurgency. It is the army that makes the argument for war – each of those tweets is an argument for war – and explains why civilian deaths are not only tolerated but necessary. Palestinian families making bad choices and failing to protect their children. There are echoes here of Robert Gibbs’ justification for the murder of Abderrahman Anwar al-Awlaki, but even Robert Gibbs, even the CIA wouldn’t have the nerve to tweet this. (The CIA is not on Twitter. Maybe it will open an account, after this week.) Note however that the justification is pre-emptive. In warning of the inevitability of civilian deaths, it makes civilian deaths happen. Since beginning of #PillarOfDefense, the IDF has targeted 156 terror sites in the #Gaza Strip. The IDF targets terror sites. A terror site is wherever a bomb or an artillery shall lands. War is surgical because Twitter is surgical. Who knew the practicing the art of creating the perfect message under 140 characters would lead to this? War existed before social media, but not like this. This is a new thing. Imagine reading the IDF feed from inside one of those homes. Imagine scrolling in real time through the continually updated rationale for why your life is expendable, for why you might be killed in the name of security. Imagine reading the approving responses and watching the retweets accrue, knowing that you cannot silence that outrageous voice, that nobody could or will. War is social now. This is what is new. Giovanni Tiso is an Italian writer and translator based in Aotearoa/New Zealand and the editor of Overland’s online magazine. He tweets as @gtiso. They must consider their opposition very stupid. Letting your troops tweet photos of themselves (with weapons, and are they wearing some kind of uniform?) tells the other team’s intelligence who they’re deployed with, possibly what unit they’re in, clues as to their location, etc. It’s stuff the guys at Bletchley Park, or in any cold war TLA would have given their tea rations for. If the intention of the IDF was to strike surgically at Hamas and to limit civilian casualties among the Palestinians, wouldn’t putting the targets on alert make the job harder, thus either make the operation less effective or prolong it and increase the collateral damage? The only explanation I can personally come up with is that the tweet was a taunt designed to provoke the exact reaction it got from the Alqassam Brigades (“You Opened Hell Gates on Yourselves”). In other words, that it was part of a social media strategy. War is social? I like it – your critique of the social-isation of war – even worse, war is acknowledged as being banal, so the need to make it social (and alarmingly, a further acceptance of violence as being natural). Myth taken to a new level? The medium is not only the message, but the mediation too. Twitter has now shut down and IDF spokesperson parody account but allows the real thing to continue its gangsterish performance. Meanwhile, here in Australia, Gillard and Abbott have announced complete solidarity with the Israelis, while the Greens have shamefully refused to take sides. Interestingly, the best stance within parliamentary politics has actually come from Labor Senator Doug Cameron. Still awaiting the first words – any words – on the subject from any of New Zealand’s left wing parties. What the internet is doing and has always done is illustrate in almost banal ways how connected we’ve always been. Not with a #bang but a #tweet.